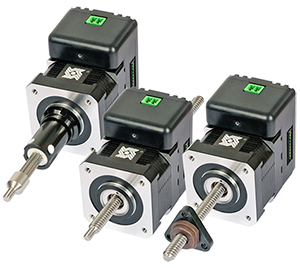 The 43000 Series Size 17 Single Stack Hybrid Linear Actuators with integrated IDEA™ Drive is available in a wide variety of resolutions – from 0.00006-in (.001524 mm) per step to 0.00192-in (.048768mm) per step. Delivers output force of up to 50 lbs (220N), or speeds exceeding 3 inches (7.62 cm) per second. Available in captive, non-captive and external linear. The IDEA™ Drive software with on-screen buttons and easy-to-understand programming guides, generates motion profiles directly into the system and also contains a “debug” utility allowing lineby-line execution of a motion program for easy troubleshooting.